I don’t have the keys, and I never will. I don’t know the owner, and I’ll never meet him. This definitely isn’t my car, but I’m about to get in and drive off. This isn’t a tale of daylight robbery, nor me recounting my latest escapades in GTA. No, this is a real story of a simple – and surprisingly affordable - technology I wish I could buy right now for my own car. As I walk up to the 2013 Audi A3 parked on a side-street in East London I slide my iPhone 5S out of my pocket and I look nervously over my shoulder. Is that man staring at me? I'm not stealing this car, honest. Move along, nothing to see here. I unlock the phone, load an app and gain access to the car – a vehicle owned by a member of the public, and one I’ve never come into contact with in my life until now. It’s the tech, more than the novel hire service, that has really piqued my interest here – I want it in my car. Right now. Unlocking a car with your smartphone is nothing new, but until now it’s been reserved for premium models which come with the technology built-in. The key part of the technology I used is that it can be installed in any car, making dumb cars somewhat smart. While the Audi A3 has a color display, Bluetooth connectivity and satellite navigation, it can’t be unlocked with a phone. Instead, online vehicle hire service HiyaCar has installed a small device which plugs into the Audi’s onboard computer and allows renters to lock and unlock the car from the firm’s smartphone app. The car isn’t owned by the hire firm though. Rather, people who find their car spending a lot of time sitting outside doing nothing can advertise their vehicle on the app for others to rent by the hour or day. It’s a similar service to AirBnB, only you know, for cars. 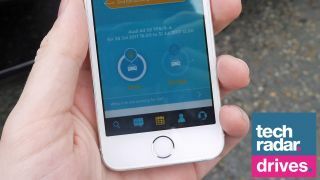 Insurance is covered in the price you pay to rent the car, and with a virtual key on your smartphone the owner doesn’t need to worry about you stealing the physical key, or getting another one cut. In fact, you don’t even need to meet the owner, which makes pick-ups and drop-offs much easier. And the best thing about it – HiyaCar currently charges just £99 to have it installed. That’s much cheaper than buying a whole new car and a price I’d more than happily pay in return for the functionality if it were available to me. I spoke to HiyaCar COO & co-founder, Rob Larmour about the technology the firm uses to provide this service, and it’s surprisingly flexible, quick to fit and affordable. The average install of a QuickStart Box takes around 30 minutes, and it can be done at the side of the car, on driveways and in carparks. It plugs in to almost any car – transforming older, ‘dumber’ cars into something a little more 21st century. As well as allowing you to lock and unlock, the QuickStart Box can also let you start the ignition in cars with a push-button system – elevating the system above the keyless entry Car Club offerings. For older cars which still require a physical key to be inserted and turned in the ignition, a ‘dead key’ is kept in the glovebox. This allows the user to start the engine, but not lock or unlock the car. If it were to be stolen, the thief wouldn’t be able to access the car if it was locked, nor would the dead key start the ignition without the car being unlocked via the app first. The box also comes with GPS and telematics, allowing the location and vital stats of the car to be tracked remotely, providing an additional layer of security for the owner. There are a few limitations for now. You currently can’t use the tech as the owner, as the app only allows it to be utilized by the person hiring the car, plus you need to be within Bluetooth range of the car for it to work. That means you won’t be unlocking your car from the other side of the parking lot, as you need to be within a few feet of the vehicle for your phone to connect. It takes a few seconds for your phone to connect via Bluetooth, which means there’s a delay once you’ve approached the car before you’re able to get it. If you’re looking for a quick getaway you may not want this, but on the plus side you can have the engine running before your bum hits the seat. This is an exciting development in the car tech world, and considering the reasonably low cost and quick install time it’s a piece of technology I can see catching on. A tweak of the app, a slightly quicker interface and easy availability will have me reaching for my wallet in no time.